EDWARD D. TOWNSEND. Brig. Gen. and Assistant Adjutant General. 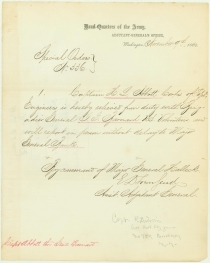 3 Special Orders Signed, from the Adjutant-General’s Office, War Department, to (and docketed by) Capt. Henry L. Abbott, Colonel of Volunteers, Corps of Topographical Engineers, variously under Generals Barnard, Banks, &c. Henry L. Abbott (1831-1927) commanded the Army of the Potomac’s siege artillery at Petersburg. For this and other recognizable services during the war, he was brevetted brigadier general. # 20577.01 EDWARD D. TOWNSEND Manuscript Document Signed, Special Orders No. 336, Nov. 9, 1862. 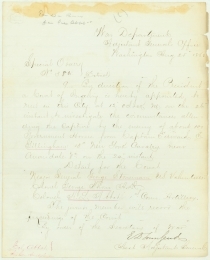 Relieving Abbot from Duty with Brigadier General Barnard, and attaching him to Major General Banks (for his expedition)..
# 20577.02 EDWARD D. TOWNSEND Manuscript Document Signed, Special Orders No. 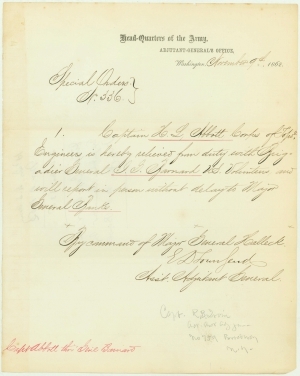 19, Jan. 18, 1863; Granting Captain Abbot a leave of absence so he could accept command of a company of volunteers. # 20577.03 EDWARD D. TOWNSEND Manuscript Document Signed, Special Orders No. 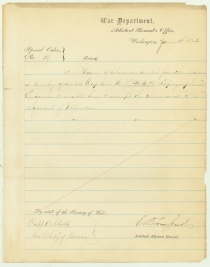 380, Aug. 25, 1863; By order of president, appointing Abbot to Board of Inquiry about the capture by Confederates of 100 Union horses.